In 1982, Benckini Landscaping incorporated and started transplanting trees and shrubs with an 80″ tree spade in the Lehigh Valley. Presently we have (5) different size tree spades (28”, 32”, 38”, 48” and 90”) , to service our customers. Our state of the art equipment allows us to apply the proper techniques to suit the needs of our customers. We are owner/operators who can offer the most effective and experienced service in selecting, moving and caring for mature trees. 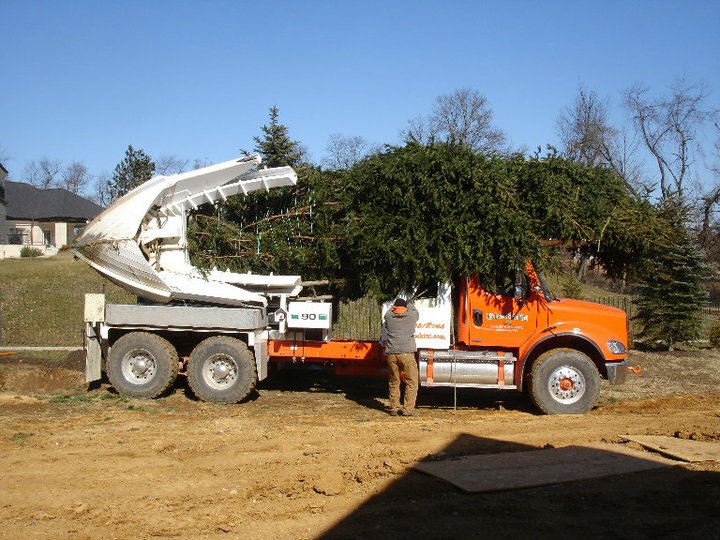 We can easily move and transplant trees from 2″ to 12″ trunk diameter and evergreens up to 35′ tall. We are one of the few companies that grow our own trees for our customers in the Lehigh Valley. 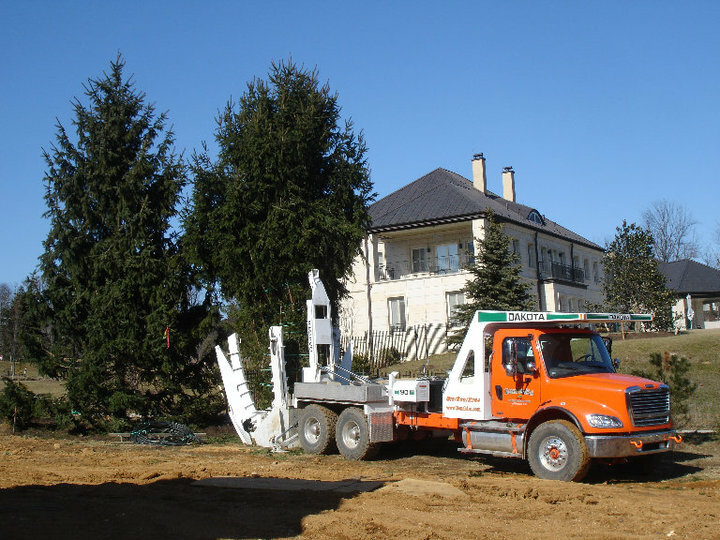 We can help you achieve maximum beauty and value to your property with your landscape projects by rearranging and transplanting your existing trees or helping you select new trees from our large selection of locally grown conifers and deciduous trees. You can have the landscape environments that you want now without waiting 15 to 25 years for a smaller tree to grow. 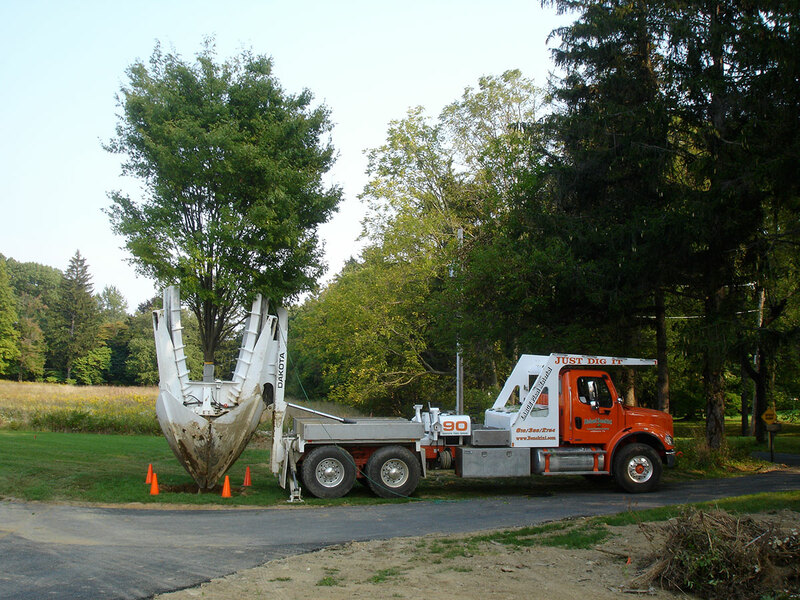 We relocate trees on site as well as moving trees to a temporary location and back to a permanent location after construction. Any tree transplanted should survive as long as the appropriate size root ball, proper before, during and after care is done. Our staff will select the most effective equipment by utilizing a number of factors, addressing different regions, plant varieties and soils. Trees transplanted using a mechanical transplanter always thrive better than using a backhoe or other types of equipment. we can transplant trees from March through December. We are fully licensed, insured and all workers are covered under workers comp. We have thousands of satisfied customers, so we can provide referrals available upon request. Think Safety first. We call PA One Call to survey the property to ensure that the underground utilities are properly marked. 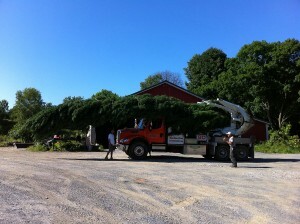 Benckini Landscaping has one of the only 90″ tree spades in the Lehigh Valley area. This large tree spade gives us the opportunity to move a large solid root ball, which means less transplanting shock to the tree. Transplanting or relocating large trees needs to be done with care and precision. We will evaluate the landscaping site and determine the best solution for your tree’s needs. All the necessary materials and equipment to gain access, transport, plant and backfill will be provided by us. We will first come to the site and dig the tree hole. Next, the hand selected tree will be tied and prepared for transport. We use loader mounted tree rings to tie up trees to help minimize broken branches. We back the tree spade carefully around the tree. The root ball is cut from the earth with our large hydraulic spades and lifted slowly from the ground. 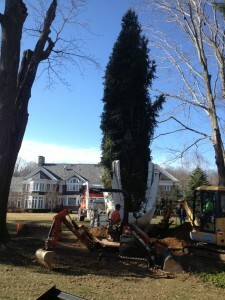 Once lifted, the tree will be prepared for relocation. If going down the road while the tree is in leaf, we will shade tarp the entire tree to protect it from the elements. This is to promote woody and fibrous root growth, while helping to protect it against insects and diseases. For an additional fee we will secure the large trees in place with angle iron stakes, galvanized aircraft cable and clamps. Tree transplanting offers you the alternative to move a mature tree when it has outgrown the area it was originally planted in. This usually happens when ideas change at your property and the tree interferes with a building addition, septic system or other new construction projects. You no longer have to cut the tree down because we can move it to another location. This will save you money because a large tree moved at your property will be only a fraction of the cost of newly purchased tree. This will provide you with a more satisfying and cost effective solution to your landscaping problems. Needs at least 10′ around tree with no obstacles. Our tree spade is equivalent to a large dump truck. Rootball Weight: approximately 11,000 lbs. It is important when watering newly transplanted trees that the original soil ball and surrounding soil is saturated. Apply water slowly to entire area, allowing adequate penetration. This can be achieved by allowing a slow trickle come out of your garden hose for 12 – 24hrs. Watering is normally required 1-3 times per week for the first month and then weekly for the rest of the first growing season. Watering should continue as needed for 2-3 seasons after transplanting. Reduced damage to tree trunks and roots from mowers, weed whips, etc. Provides an attractive finish to shaded areas underneath trees where grass grows. After transplanting a tree, we apply a 3”-4” layer of shredded bark wood mulch around the root ball of the tree. The mulched area should ideally reach out 10-12″ past the original root ball. season.